In the business world, you are probably sending hundreds or even thousands of emails per day. All of these emails have a chunk of text in common. All the emails that you send contain your email signature together with your contact information. Having an email signature is an important part of the emails that you send because it will provide people with more information about you and your company including other contact information. We have seen many of these email signature styles that are found in the emails that we receive from time to time, some are even funny. By using the right email signature, you can help your company make an impression on the people that will receive your email. There are email signatures that seem to have tons of links and pictures that are attached to it. For a good email signature, you must keep it short and simple. There are even some guidelines that will help you make it among the effective and interesting best email signatures. A basic email signature contains a name and title, link of the company website and the icons and links to the company’s social networks like Facebook and Twitter. You can also add some personal touches in your email signature that will make your email signature unique. But be careful in making your own email signature because even with all the links and the images that you will attach to it, it must still maintain its professional look for it to have an appeal on your potential clients and the clients that you already have. To help you in making the email signature that could meet your needs, we give you the top email signatures that will inspire you to make an email signature that could even look better than that is on this list. This is one of the simplest ways in making your own business signature. 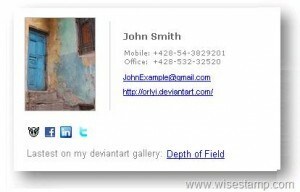 You can also add the picture of your establishment on your email signature. Just make sure that it will not be too large, just placing it beside the text and keeping it simple will do. Although it only has the basic contents of a signature, it is one of the best ways in making your email signature. 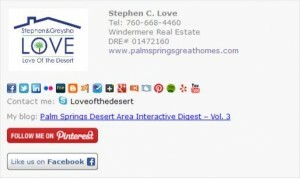 This shows you can also promote your company’s logo through an email signature. 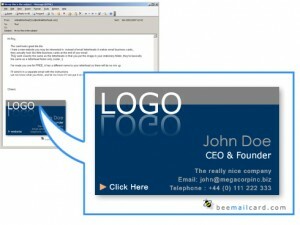 In this sample, the basic format of an email signature is present, but instead of using a picture, the company logo is placed above the sender’s and company information. You can utilize the email signature in many ways, you just have to be creative and think of other possible ways you can make your own. 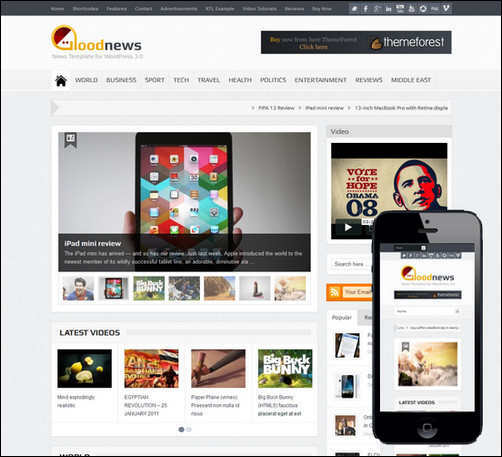 Cookie Web is a service provider that helps their clients in making websites and other services. 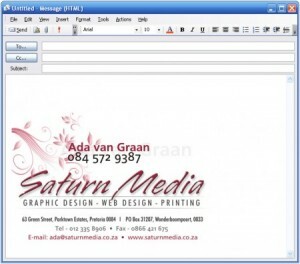 They can also help you in making your own email signature. They can give you advice on making your own email signature. They can help you by giving you the guidelines that will make your email signature as simple and as informative as possible. Email signature is a must in sending an email especially if you want to increase your sales and if you want high percentage when it comes to getting responses from the people that you sent an email to. An email signature is also a way for clients to contact you. 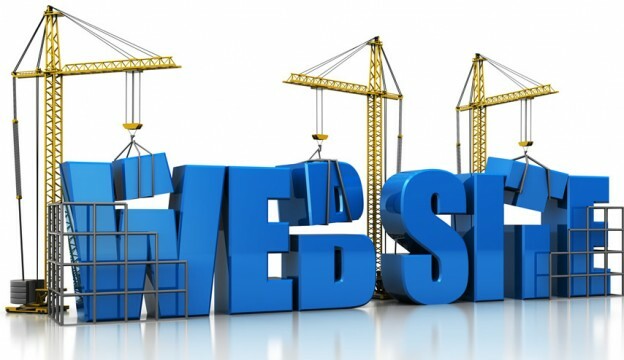 You have to make sure that also include the links to your site and other contact details. This site can provide you with the tool that you can use in making your own email signature. You can download the tool easily and the Wise Stamp icon will appear on the Chrome extension bar. Then you can easily make and edit your own email signature. You can include your own picture or your company logo. You can also upgrade it to a plan that can meet all your business needs. Mindshift Media is another online service provider that specializes in giving the help for all your digital marketing needs. Having a custom email signature is now becoming a trend in the online business today. An email signature is used as an electronic business card and it will give people the chance to locate the sender easier. By including an email signature, your messages will no longer be labeled as spam. This is another way of making a good email signature. You should cease in using colored and even images for your email signature, it will lessen the size of your email signature and it will be easier for your clients to read the information that are attached to it. This signature is another good example of simplicity. Just the name of the address of the sender, but you can also include other information here, like the company name, logo and other contact details that will make it easier to locate the sender. This is a good way of making sure that people who are interested to do business with you will locate you and be able to read the emails that you sent. It is good to make your email signature an interesting one. It includes all the information about the company, the address, the logo of the company and name of the person to be contacted and the links to the company’s website. This is one of the best ways that you can make your email signature. You can also make a signature block before making an email signature that is placed automatically at the bottom of the email. It will give it a more professional look. It may also include the title of the sender, the company logo, and all the contact details of the company. 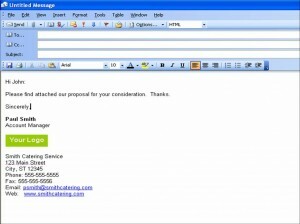 Sigwich allows the user to make an email signature with Outlook, Gmail, Yahoo and other leading webmail providers. You can make your own email signature fast. The best thing is that you can create your own email signatures for free. those are the absolute worst and most visually confusing pile-of-mess signatures I’ve ever seen!! Are you serious? We are going to use this over at http://thedsmgroup.com I was going to write a post on this, but this was what I was looking for. We will use this at http://britishenglish.tv/, where you can learn world English. Really nice post. Keep it up. Thanks a lot.